Keeping Out the Wild Rabbits! My wife and I have wanted to start a vegetable garden for many years now, but our biggest obstacle is the wild rabbits! There are hundreds, if not thousands of them in our area and any vegetable plants we put are eaten overnight. We are thinking of apportioning off a small section of our yard with rabbit-proof fencing, but there are the aesthetics to consider also, as we have an organic looking, beautiful yard and do not want fencing right in the middle of it. Any recommendations? How can we deal with the rabbits (my wife already ruled out poisoning them and I tend to agree). Do wooden fences work? Can rabbits jump over them? Any other suggestions? There is a type of fencing designed to keep rabbits out. It's called rabbit fencing, and if you ask for that at your nearest home improvement or hardware store, they should know exactly what you're talking about. Rabbits dig, however, so you would probably have the best luck if you laid about 12" of chicken wire on the ground along the outside of the bottom edge of the rabbit wire fencing. The rabbits won't be able to dig through it. They could easily bite through chicken wire, but I doubt they'll be inclined to do so when it's flat on the ground. That's the best non-lethal solution I can offer. Others may have better ideas. Plant a double row of onions around your garden, as rabbits do not like onion. Plant clover around your garden. They will tend to eat this first instead of your vegetables. Spray a diluted solution of hot pepper sauce(Tabasco), and water on your vegetables. May need to be reapplied after a rain. Try planting with raised beds which are 18 inches in height. Install motion sensor water sprinklers, which will scare away the rodents once their presence is detected. Sprinkle fox or coyote urine around your garden. Can be acquired from many garden, or farm supply stores. Place rabbit traps in your garden. Then you can release them miles away from your home. Get a cat or dog. Or several of them. So far, so good, nobody suggested killing them. I have two little boys one might call rabbits, and I also love their outdoor cousins. I use 24" high chicken wire around my garden, slightly buried at the bottom to prevent the rabbits from burrowing under. I've never had a problem with rabbits jumping the fence or with them biting through the wire. If you'd like a more decorative look to your fence, you can line the inside of a small wooden fence with chicken wire - you'll see the wooden fence and the wire fencing will practically disappear. I have experemented with a motion detector and a school bell. When the bell rings the animals run away. They come back and the bell scares them away again. After scaring them away several times they learn not to come back any closer than the place where the bell goes off. It is interesting how they sneak up very slow they finally learn not to get any closer and the bell will not go off. During the day you can come and go to the garden as often as you like the bell never goes off when the sun it up. Gary350 wrote: I have experemented with a motion detector and a school bell. When the bell rings the animals run away. They come back and the bell scares them away again. After scaring them away several times they learn not to come back any closer than the place where the bell goes off. It is interesting how they sneak up very slow they finally learn not to get any closer and the bell will not go off. That might work for DeborahL's boys, too! School bells and little boys are known to be like oil and water! They don't mix well! Unfortunately, the only solution short of killing the rabbits, it to fence an area. I would use 1 inch mesh chicken wire 4 feet wide and bend ten inches over to lay on the ground on the outside to prevent digging. No, the rabbits will not bite holes in it. If aesthetics are more important than utility, maybe you can grow some house plants? Re: Keeping Out the Wild Rabbits! applesofgold wrote: . . . Do wooden fences work? Can rabbits jump over them? Any other suggestions? I don't think that rabbits will jump a very high fence. To give you an idea of what they can get thru - I've seen cottontails go thru a woven wire fence without hardly slowing down . Those fences are popular in suburban areas but so, seem to be, the dang rabbits! The neighbors to my big veggie garden are very tolerant of the wild rabbits and there are some people about 1 mile down the road who have released domestic rabbits onto their lawn . They have been there for years and I think that the big spruce trees, with branches all the way to the ground, are the only things saving them from the coyotes! I am really hoping the coyotes keep ALL the rabbits a little more in check but know that dog & cat owners aren't too happy about so many coyotes around . . . I'd bet that a wood picket fence of about 4' with chicken wire on the inside would keep rabbits out. The wire would have to go into the soil or they will just dig under. And, it would need to be a solid board fence to keep them from just walking thru without the wire behind it. 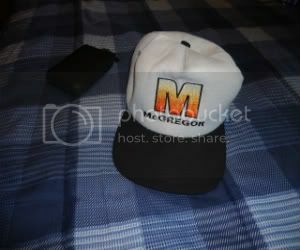 Haha, the hat says McGregor, as in Mr. McGregor from the Peter Cottontail book. I use to know a guy that had a wire fence around his garden to keep out rabbits and other small animals. Instead of putting up a gate to get IN/OUT of the garden he dug a hole 3 ft wide between the 2 fence posts, 2 ft across and 2 ft deep. The sides of the hole were straight up vertical. Animals would come at night and walk around the fence looking for a place to get in. When they came to the gate opening they fell in the hole and could not get out. He had a small wooden box trap in the bottom of the hole, when the sun came up night animals went into the dark box. He would drive the animals down the road several miles and let them out. Cool idea. Farm supply stores have 14 guage 1" x 2" mesh fence wire it comes in 2, 3, and 4 ft heights, 50 and 100 ft lengths . Chain link fence is about the same price.